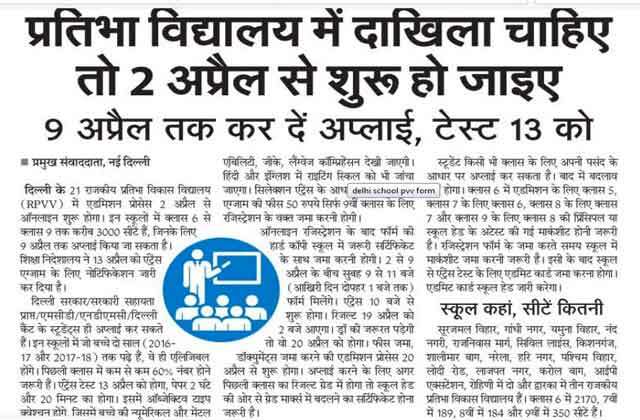 Rajkiya Pratibha School Admission process in 21 (RPVVs) schools of Delhi will start online starting April 2. These schools have about 3,000 seats from class six to class nine, for which can be applied online until April 9. Directorate of Education has issued notification for the Entrance Examination on April 13. Rajkiya Pratibha Vikas Vidyalaya Admission Form will be available online from 2nd of April, 2018. The students of Delhi Government / Government Assisted / MCD / NDMC can apply for Admission in the Rajkiya Pratibha Vikas Vidyalaya only. Those children who have studied in these schools for two years (2016-17 and 2017-18) are eligible for admissions. It is important to have at least 60% marks in the previous class. However, if the result is in the form of Grades, then the applicant will produce a certificate issued by HOS of School converting the grades into marks. Rajkiya Pratibha Vikas Vidyalaya Admission Form is available at www.edudel.nic.in. The entrance test will be of 2 hours, the Rajkiya Pratibha Vikas Vidyalaya entrance test paper will be 2 hours and 20 minutes. There will be objective type questions, in which the child’s Numerical and Mental Ability, GK, Language Comprehension will be tested. Apart from this, Writing Skills will be tested in Hindi and English. The venue of Entrance Test will be in the respective RPVVs in which the student has been registered for Admission except in the case of RPVV Sec-5 Dwarka whose venue of Entrance Test will RPVV sec-10 Dwarka. Entrance Test Fee – For admission in 9th class, Rs 50/- will be charged as examination fees, which has to be submitted at the time of registration. No examination fee for Entrance Test will be charged from students for Class VI to VIII. Merit List – Selection will be based on the merit of Entrance Test of respective RPVV. The enrollment in one section of a class will not exceed 35 students. However, in case the enrolment is less than 20, then no other section will be started. An online module has been designed for registration of students for Entrance Test for admission in RPVVs from Academic Session 2018-19. The HOS of the Govt./Govt. Aided Schools of DOE, NDMC and Delhi Cantt. Board Schools will register online their eligible students for Entrance Test for Admission in respective Classes in RPVVs for Academic Session 2018-19. After online registration, the hard copy of the form has to be submitted to the school with the necessary certificate. Between 2 and 9 April, the forms will be available from 9 am to 11 pm (last day till 1 pm). Click here for more information on How to Apply Online for Rajkiya Pratibha Vikas Vidyalaya. The entrance test will start at 10 o’clock and the Rajkiya Pratibha Vikas Vidyalaya Admission result 2018 will come on April 19 at two o’clock. If for some reason a draw is required, then it will be on April 20. The fee submission, document submission, and the admission process for the new session will start on April 20. To apply, if the result of the previous class is in grade then it is important to have the Certificate of Change in the grade marks from the School Head. Students can apply for any class based on their choice. There will be no changes later. Hence, all the applicant are advised to get themselves registered for the entrance test in RPVV of their choice. For admission to Class 6, Class 7, Class 8 and Class 9; previous class mark sheet has to be attested by the principal or school head. Admit Card: The Admit Card will be issued by HOS of respective RPVV in which a student has been registered for Entrance Test after receipt of hard copy of registration form with requisite documents from the parent of the student. The schools of NDMC, if not linked on MIS link with DOE, then the application form of students of NDMC schools will be accepted manually by respective RPVVs. While submitting the registration form, the mark sheet will be submitted to the school. After this, the Admit Card will be received from the school. School Head will issue the Admit card. There are 21 Rajkiya Pratibha Vikas Vidyalaya in Delhi located at Surajmal Vihar, Gandhi Nagar, Yamuna Vihar, Nand Nagari, Rajivas Marg, Civil Lines, Kishanganj, Shalimar Bagh, Narela, Hari Nagar, West Vihar, Lodhi Road, Lajpat Nagar, Karol Bagh, IP Extension, two in Rohini and three in Dwarka. There are 2170 seats in class 6, 184 in 7th, 184 in the 8th and 350 seats in Class 9th. Applicants / Parents of the ward may contact the respective HOD of where the student is presently studying for registration for Entrance Test for admission in RPVVs mentioned in the advertisement as well as in the admission notice. They can also contact the HOS of RPVVs on any working day for clarification regarding the availability of seats and submission of application form etc. If any discrepancy is found in respect of documents submitted or false information submitted by the candidate at any stage/level, then his/her candidature/ admission in RPVV will summarily be rejected without any notice. Please share this article so that everyone can get this information and press CTRL+D button to bookmark this page.